The top five Canucks prospects are loaded with potential, and exhibit just how deep the team’s system is. Get excited about the talented players on this list, Canucks fans, because in a few years they could all be key players for the franchise. 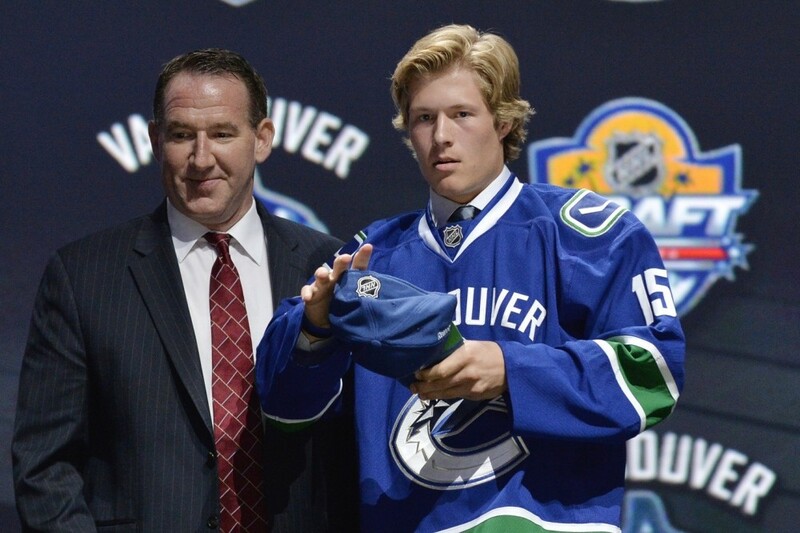 Brock Boeser is a natural scorer who has great offensive upside. He tallied 35 goals in 57 games for Waterloo in the USHL last season. Boeser’s ability to create scoring chances combined with his puck possession skills make him a dynamic offensive forward. He needs to improve on small details and be a little more adept in his own zone, but at 18 years old, he’s got lots of room to round out his game. Canucks GM Jim Benning praised Boeser’s skills after drafting him, and has said he sees Boeser as a top six forward with the team in 3-4 years. Boeser should have a bright future in Vancouver and has the potential to be a pure goal scorer, something the Canucks need, especially once Radim Vrbata moves on. The 23rd pick in this year’s NHL entry draft will spend next year playing NCAA hockey at the University of North Dakota. Thatcher Demko has been tabbed by some as a goalie who could be the future in the Canucks crease. The second round draft pick in the 2014 draft had surgery on both his hips this offseason, but Demko has since returned skating and should have even better flexibility and movement, which was limited for years before the surgery. “This will be the healthiest I have been. 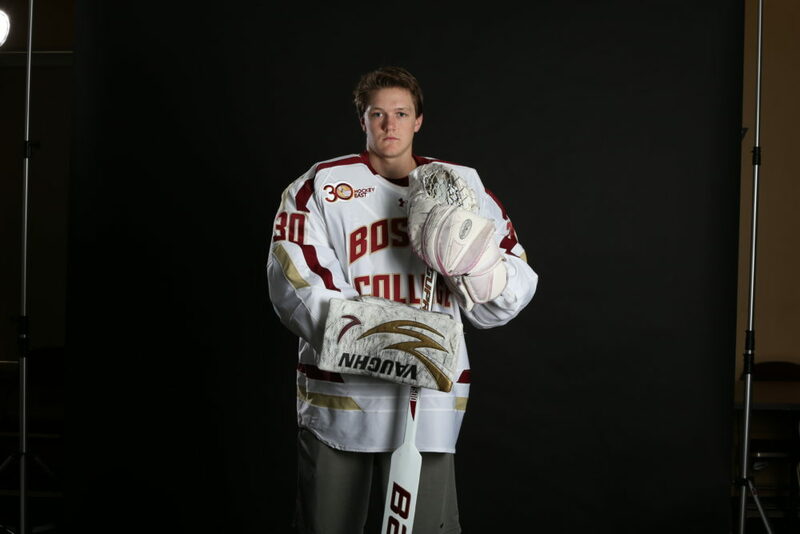 Ever… I have just been looking forward to the day I can play pain free for about four years” – Thatcher Demko, Canucks goalie prospect. 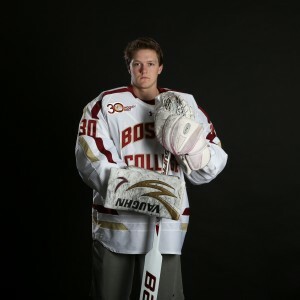 Heading into his third year with Boston College, Demko has posted an exceptional save-percentage and goals-against-average both of his first two seasons. He’s an exciting prospect for the Canucks; the 6’4″ butterfly-goalie Demko covers the net well and has shown he has excellent lateral movement, and shows great calmness in his game as well. The 19 year-old Demko will only continue to get better playing NCAA hockey, especially with the improvements he should have following his hip surgery. Just hang on for the next 3-4 years, Canucks fans, and cross your fingers Demko doesn’t get traded before then. 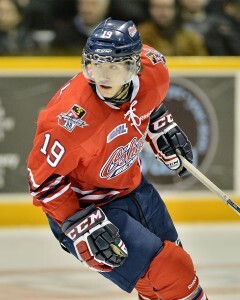 On the way to the Oshawa Generals winning the OHL Championship and eventually the Memorial Cup earlier this year, the play of center Cole Cassels turned a lot of heads in the hockey world. He had 19 points in 16 playoff games for the Generals, and most notably outmatched Connor McDavid in the OHL Finals. Cassels is as versatile as they come of the Canucks prospect. He’s rugged defensively and skilled offensively, and is a prototypical two-way scoring forward. And as good as Cassels was in the regular season of his overage junior hockey campaign, he elevated his game during playoff time with the Generals. Cassels will likely start the season with the Utica Comets, but based on how complete his style of play is, he could be a regular in a Canucks uniform sooner than later. The former third round pick for the Canucks in 2013 has the potential to fill a Ryan-Kesler-like void in the future. Another highly touted center in the Canucks system, Jared McCann is a two-way forward who has exceptional playmaker skills. He’s got an excellent hockey IQ and a strong work ethic in all zones on the ice. He could prove to be a reliable center in the Canucks lineup in the future. 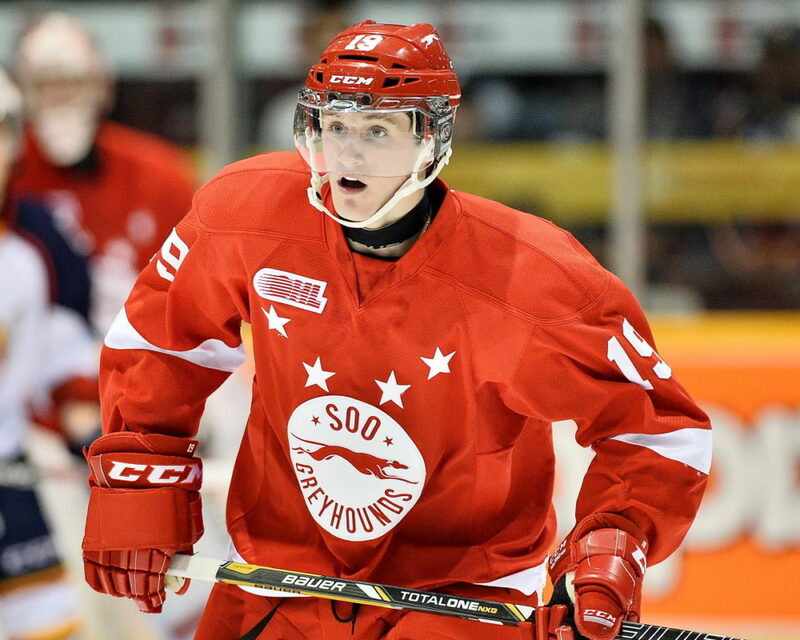 The 24th overall pick in 2014, McCann is coming off a strong year in the OHL with the Sault St. Marie Greyhounds, posting 81 points in 56 games, as well as 18 points in 16 playoff matchups. 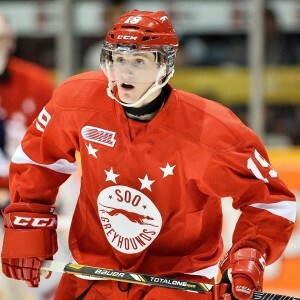 The 19 year-old McCann will return to the Greyhounds next season and should continue to put up great numbers – granted on how he recovers from a recent concussion at the World Juniors Showcase. McCann plays a complete game, similar to Cassels, and his biggest area of concern will be to bulk up if he’s going to make the jump to the NHL in the next two or three seasons. He’s got all the tools to be a two way center with lots of offensive potential, and between Bo Horvat, Cassels, and McCann, the Canucks have a lot to look forward to with the center’s making their way up in the organization. 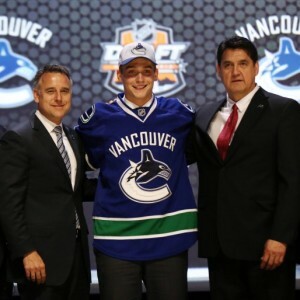 Last year, Horvat became the first 19 year-old to make the Canucks since Ryan Kesler in 2003. 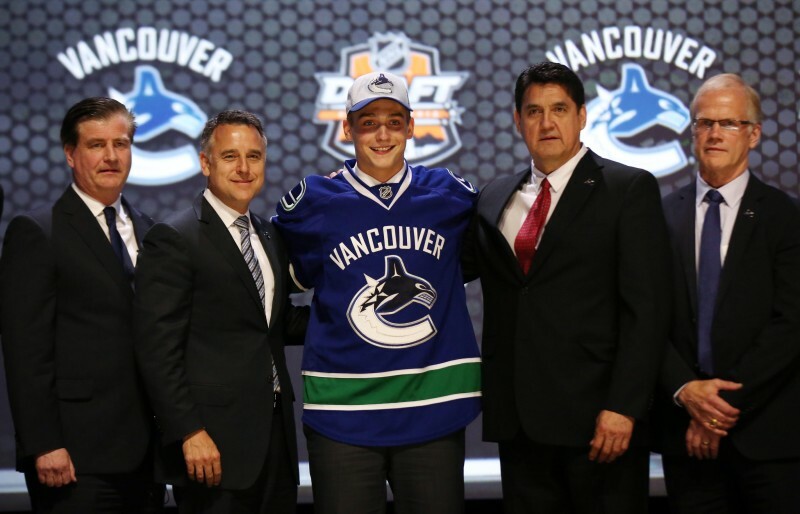 He may have paved the way for Jake Virtanen heading into the team’s training camp this year. Drafted sixth overall in 2014, Virtanen has all the makings of a dominant power forward in the near future. He’s got wicked offensive skills, is a tremendous skater and the 6’1″, 210 pound winger never shies away from being physical. Virtanen’s presence is always felt on the ice and he can physically match up against the toughest opposition. While Virtanen would have to report to the Calgary Hitmen if he doesn’t make the Canucks, his WHL club, there’s a pretty good chance he’ll skate with the Canucks to start year, granted he performs well at training camp. Expect Virtanen to play at least the nine game maximum with Vancouver before he would have to be sent back to his junior team. And based on his skills, work ethic and overall size, Virtanen may just hang around in Vancouver in 2015-16 depending how he fits in the lineup.